Every issue, for the last six or seven, we've had a page featuring a short poem by Travis Newbold. I first met Travis when I went to the Gene Romero West Coast Flat Track race at Las Vegas, in January 2010. 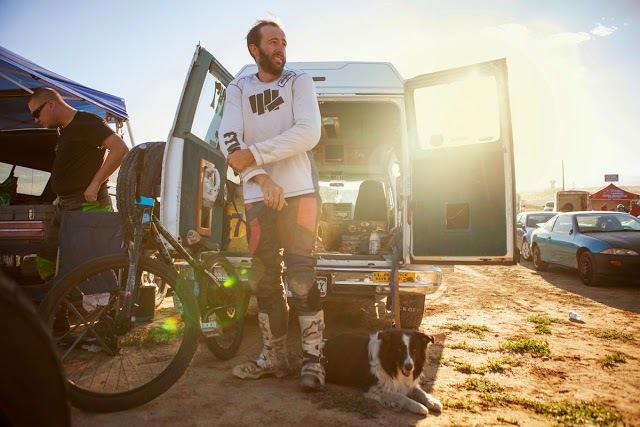 He was racing a ratty XS650 and there with his dog, Baja. We chatted, I took some photos for Sideburn and we kept in touch. Through Sideburn, Travis became good friends with the Co-Built family and has come to the UK and Europe twice to race with us. We've also been over to the US to race and watch him. The poetry is bar room, lo-fi stuff. It rhymes. It comes to him on the hellish long drives between races. He started writing it on his blog and I thought I'd like it in the magazine, first because I liked it and thought it was odd that even a cheery, gentle, but brutally fast racer, would take the time to write it and put it on his blog. Then, I wanted to include poetry because if Sideburn doesn't do things differently then we're picking fights with some pretty big publishers and that's not what we're cut out to do. It also gives us an excuse to print a photo of Travis in action. These two were taken by Dave Lehl, a customer of his (Travis also runs a motorcycle repair shop in a suburb of Denver, Colorado). Beautiful.